Whether your kids need a space for a few hours of homework, or you’re a homeschooling or online school family and require multiple study stations for a full day of learning, these colorful spaces and clever back-to-school organization solutions are sure to inspire you! 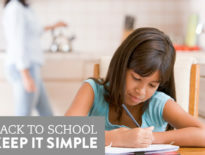 If creating a home learning area seems daunting, just remember to keep it simple. A learning space could be a desk in your child’s room, the kitchen table, or a whole room set aside for school, depending on your needs. Wherever it is, there are just a few key things you’ll want to make sure to provide. Adequate light – Good lighting is important. Bright natural light from a window is great, overhead or task lighting, like a desk lamp, work too. The main thing is that your student doesn’t have to strain to see their work. Comfortable seating – While you might want to have a couch or cozy reading nook, you’ll also want to provide a place to sit and work on a computer and write or draw. Remember that good sitting posture is important, so try to provide a chair with good support, at the correct height for students to work comfortably. 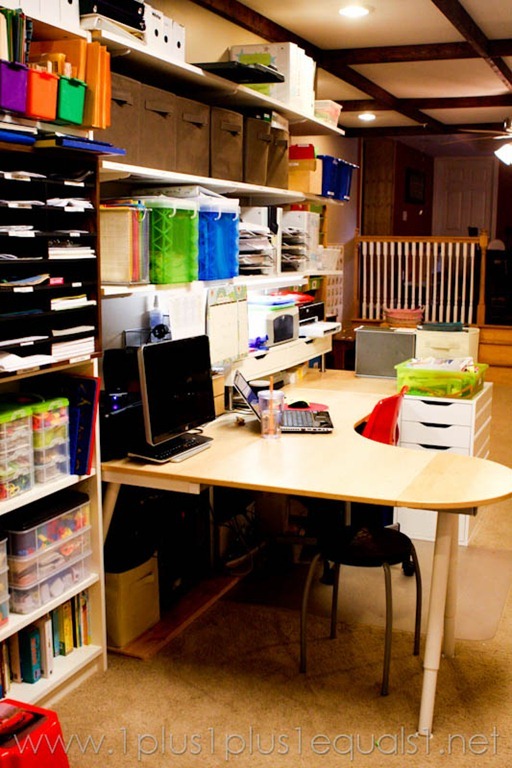 A workspace – This could be a personal desk for each student, or it could simply be the dining room table. If you have the space, a large table to spread out and work on projects or with multiple students is nice to have. 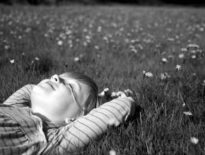 Relatively quiet and free of distractions – Try to limit distractions like toys and electronic devices in your learning space to help students stay focused on work. In a busy household with multiple students or babies and toddlers, you may want to provide a learning space apart from the rest of the living area, especially for older students who may need more quiet to focus. Organization – You’ll want to have some kind of organization system in place for your books and course materials, school and art supplies, completed work, school paperwork, and whatever other materials you need on hand. Make sure kids know where everything goes so they can get the supplies they need easily, and put them back in the right place when they’re done. As you browse some of our favorite homeschool rooms and homework stations and begin to put together your own, remember that what’s most important is that the space works for your student, your family, and your home. This formal dining room found new life as a homeschool room for the kids, and an office space for mom. We love the colorful palette, vintage furniture, and fun hanging globes and lanterns in this homeschool room. This rolling homework station, using a cool vintage library cart, keeps everything two students need for homework organized and at arm’s reach. With multiple learning stations, supplies organized and labeled by theme and subject, and learning spaces for three students and mom, this school room provides lots of organizational inspiration. 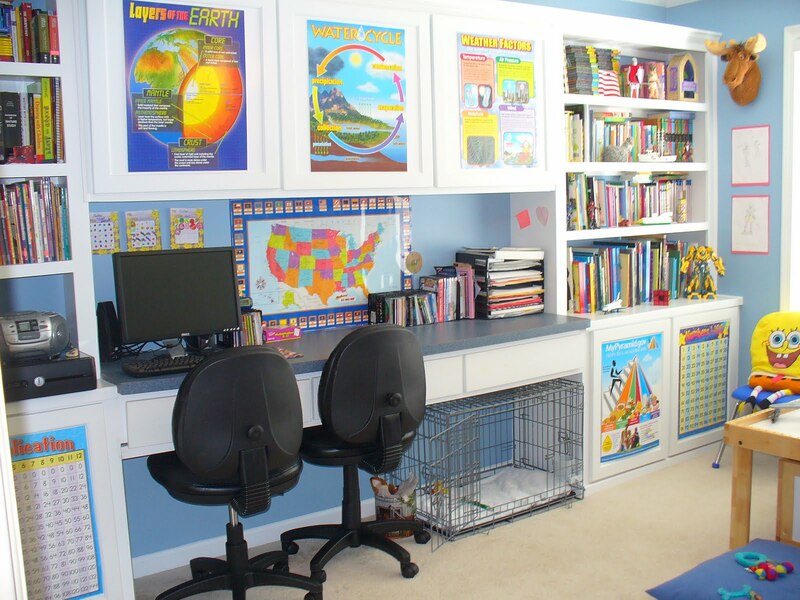 This bight and fun homeschool room includes lots of educational wall decor and also serves as the family’s playroom. Doesn’t this reading nook just make you want to curl up with a good book? Even if you don’t have a lovely window seat, a soft place to read makes a nice addition to any learning space. 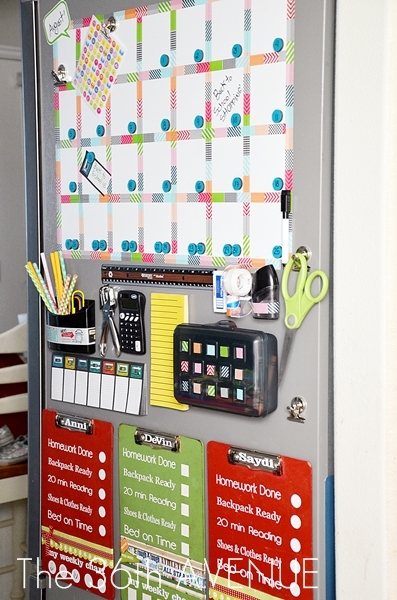 A DIY back to school station keeps every school supply a student could need organized and close at hand. Put it in the kitchen, or wherever your family does homework. 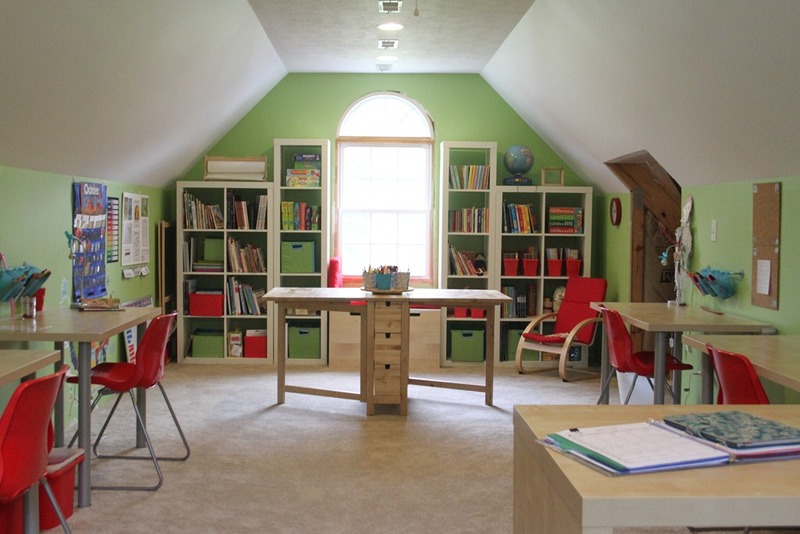 This bright and airy homeschool room has individual desks for each student, plus a table that allows everyone to work together, or folds down and out of the way for more space, making the room extra versatile. Nearly everything in this homeschool room came from Ikea, making this a space anyone could replicate fairly simply and affordably. 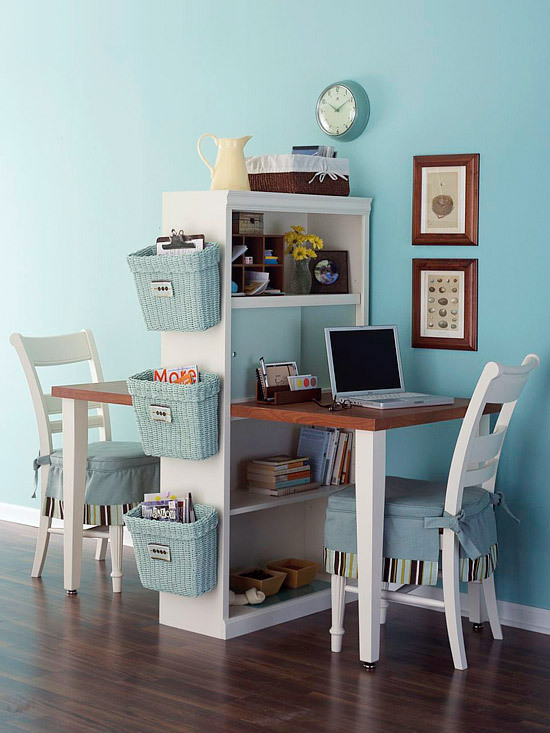 A bookcase, a board, and two pairs of legs gives you two desks in a space only five feet long! A great solution for providing two students with their own areas when space is limited. 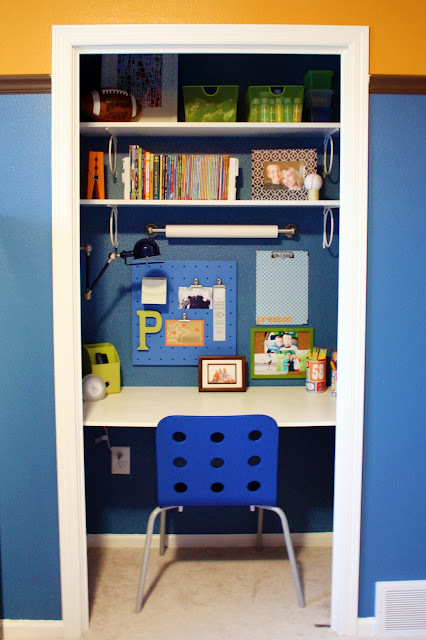 Personal touches and clever pegboard organization turned this closet into a fun and personalized homework station. 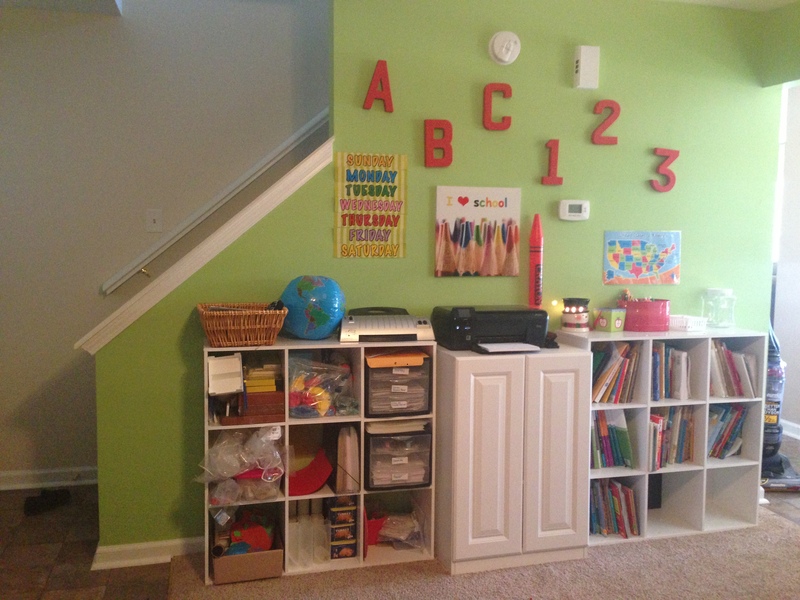 This homeschool room belongs to a family with six kids attending online school through Hoosier Academies at K12. See how they turned an unused living room into an “ever evolving” classroom that works for the entire family. 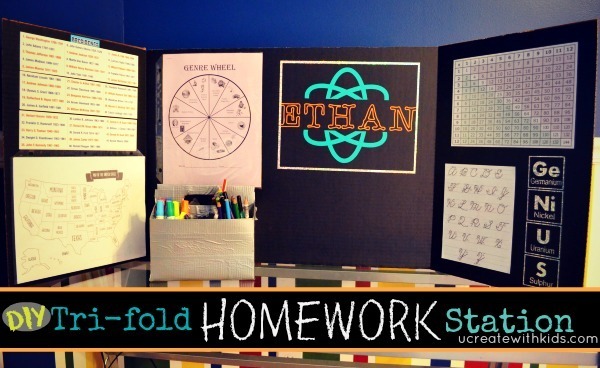 Here’s a creative idea for a portable personalized homework station using an inexpensive trifold presentation board. 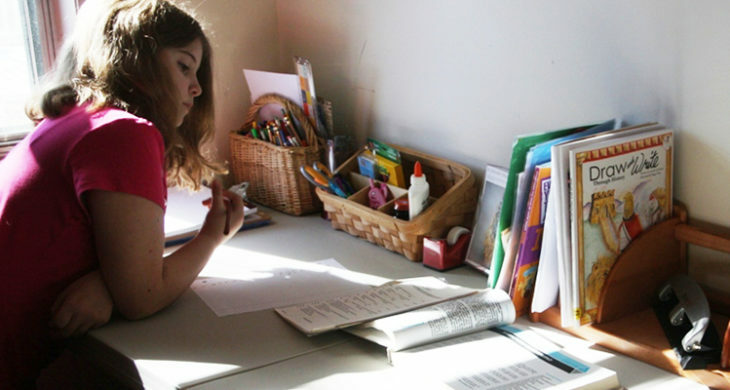 Attached plastic sheet protectors keep homework packets and papers close at hand, and when homework time is done, it all folds up and tucks out of the way. Genius! 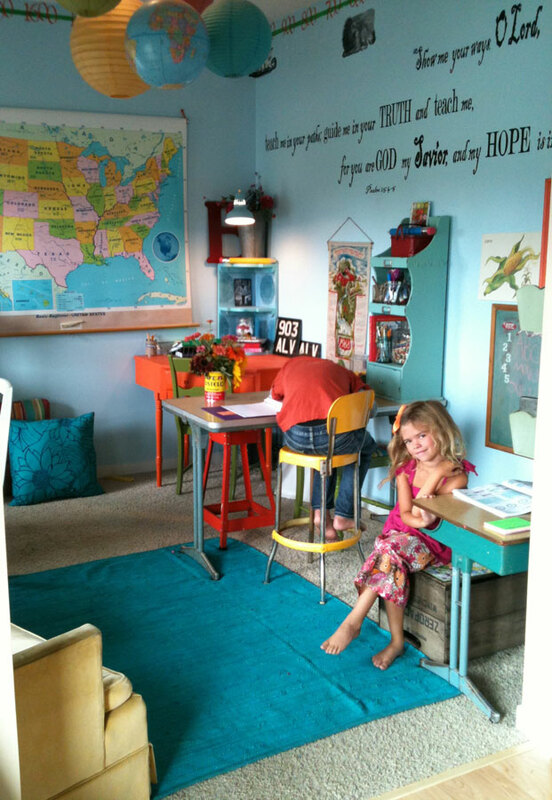 This colorful homeschool room has a lot of great inspiration, especially as a learning space for a young child that can grow with them. 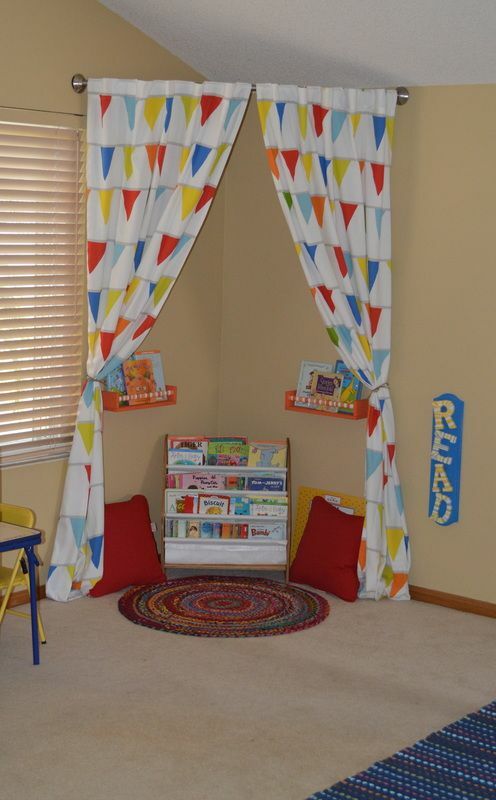 A curved shower rod, some fabric and soft pillows can turn any corner into a cozy reading nook. 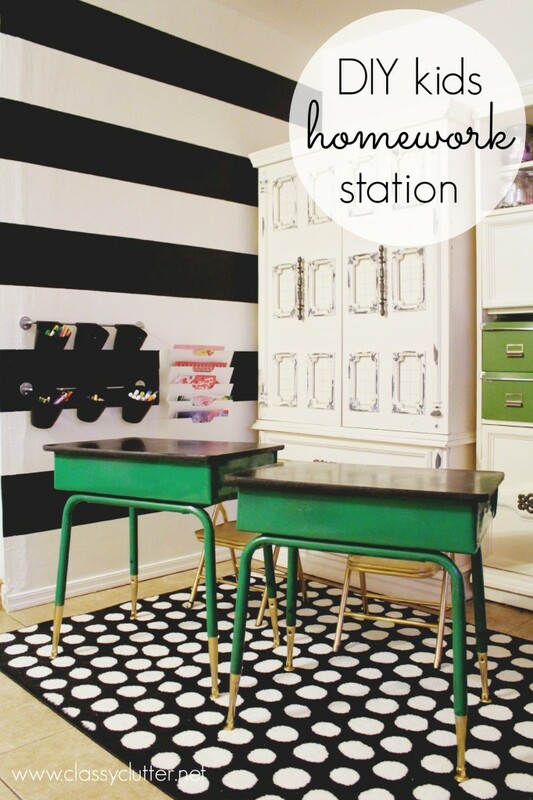 Brightly painted vintage school desks provide kids with a colorful place to do homework in this black and white playroom. 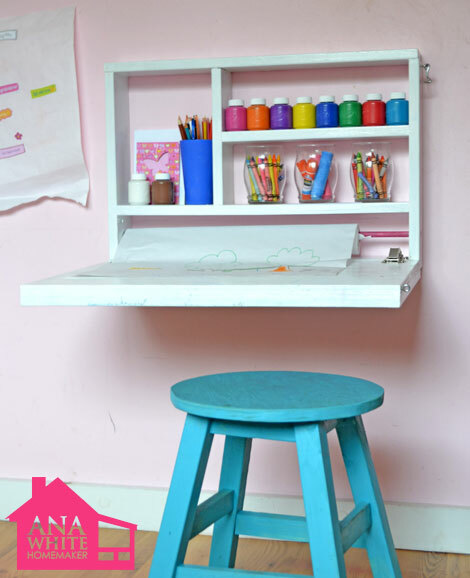 This was originally a craft room/playroom, but some vintage classroom furniture from Craigslist now lets the room pull triple-duty as a homeschool room. A kitchen table painted with chalkboard paint provides students with a place to work, and a surface to work out math problems or practice penmanship. Glass jars keep school supplies handy. If you’re short on space, a wall-mounted fold up desk is a great solution. The shelves provide a place to store supplies, and everything folds up and is hidden when not in use. Click the link below for plans to build this version, suitable for a small child. 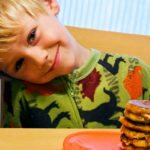 You can also find larger versions online to buy or DIY that would work for older kids and teens. For even more ideas, visit our Home Learning Spaces Pinterest board, or K12’s Facebook album full of inspiring online school learning spaces. Have you created a home learning space solution for your student? Share a photo with us in the comments.